This beautiful green-blue composite stone was once found in the southern most points of the Negev Desert, being the stone's namesake. This gem is made up of Malachite, Azurite and Turquoise. It has been given many names and has many legends attached to it. In ancient Egypt is was as the 'wise stone' due to it's capability of helping the wearer to make clever comprimises and decisons. Others recall is as the "King Solomon" stone. 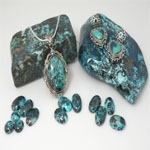 For thousands of year it was also known as chrysocolla, which properites include conciliation and reassurance. This famous, ancient stone can be found in several exotic regions including Peru and South Africa. Noa Sterling silver Ring with Shatukite and White CZ, Dimensions: 25.70 hight x 21.10 width mm.,O..
Noa Sterling silver Ring with Shatukite, Dimensions: 25 hight x 20.8 width mm.,Triangle 12x8 mm. ..
Noa Sterling silver Ring with Shatukite, Dimensions: 25 hight x 20.9 width mm.,Triangle 16x9 mm. ..
Noa Sterling silver Ring with Shatukite, Dimensions: 25.87 hight x 23 width mm., 17.3mm x 18.2mm ..
Noa Sterling silver Ring with Shatukite, Dimensions: 28.40 hight x 22.50 width mm.,Baguette 20x12..